Before you begin working your way to foreign language fluency, it helps to understand the culture behind the language you’re learning. After all, language exists to help a group of people express their ideas and beliefs. Spain is an old country with a rich history and culture. As you begin your Spanish language program, gaining a strong grasp on this history, the values, and the etiquette will help you rapidly achieve success. In particular, if you plan on visiting Spanish speaking countries, you do need to be careful depending upon which country you visit. Know where you’re going and prepare accordingly. Safety should always be one of the foremost concerns when traveling to a different country where you’re unfamiliar with your surroundings. You should not travel alone because people traveling by themselves are often targeted, particularly women. Travel with someone or in a group. You shouldn’t bring your expensive jewelry, like diamond rings or expensive watches, as this will attract the attention of thieves. Digital cameras and cell phones should be put away when not in use. When in need of cash, use ATM machines inside banks during daylight hours, instead of on the street or at night. Keep the bulk of your cash in the hotel safe and only keep a small amount on you when walking around. You can carry what’s called a “mugger’s wallet,” which is like a decoy, containing very little cash, an invalid credit card, and another outdated version of a card you normally see in a wallet, like a library or gym card. You can keep some emergency cash in your shoes or pocket. If you fall victim to a robbery, remain calm and give the mugger whatever cash you have, and don’t risk your life for a few dollars. Try to avoid very crowded areas if you happen to be wearing or carrying anything that’s valuable to you, as skilled pickpockets, some very young, can more easily rob you in these situations. Don’t walk with more cash than you need for the occasion, except emergency funds. Areas to avoid if you happen to be carrying or wearing something you don’t want to part with include the Metro and stalls in crowded markets. As an extra precaution, you can make copies of all your documents like your passport and plane ticket, as well as phone numbers for your bank and credit card companies. You can email a copy to a trusted friend or family member, as well as to yourself, in case of loss or robbery. Since Spanish is the predominant language in Latin America and Spain, it would be beneficial for you to learn the basics. The locals can advise you about the best places to visit and eat, and those places to avoid. Places you should steer clear of are the poor areas of cities and towns. When going out, you should have your hotel call a taxi instead of flagging one, especially at night. You can also ask them for a good taxi company or use Uber. Always have your trips planned instead of wandering aimlessly with a map. A trip to Latin America and Spain should be well planned and destinations mapped out, as most of the countries are large and spread out. All modes of transportation are normally cheaper than the US and Europe. Online bookings are available for flights and lodging, as well as some bus trips. The infrastructure is well organized and roads and highways are kept in good condition, with up to date, air conditioned buses that travel the main routes. Their airports serve major cities and tourist destinations. Another aspect of your trip that should be planned ahead of time and reviewed thoroughly is travel and health insurance. The best policies will include emergency medical transport, repatriation, and evacuation, and should be available in the US, UK, and Canada. Adventure sports such as zip-lining over Copper Canyon, exploring caves in San Cristobal de las Casas, or swimming with whale sharks in Cancun, always pose an element of danger; appropriate coverage is recommended. You should also make sure that companies offering activities like horseback riding, scuba diving, and whitewater rafting, have their own coverage. Insurance gives you peace of mind, especially if you’re traveling to rural areas, which are usually ill-equipped to handle major illnesses or accidents. “Express kidnappings,” or “secuestro express” (also known as a “millionaire tour” and “paseo millonario”) is when a traveler in a taxi is robbed at knifepoint or with a gun, and then robbed of all their cash and valuables. In some instances a small expeditious ransom may be demanded. Another term, lightning kidnapping, is when the victim is taken to an ATM or bank, and made to empty their account(s) over a short time period. They are then released. There’s record of occurrences of this type of crime in the Americas since 1986, but they are more frequently linked to urban areas of Latin America, such as Mexico, Venezuela, Peru, Brazil, and Argentina. There has been an increase of these robberies in recent years, so take every precaution to make sure you use trustworthy taxi drivers. Traveling in groups is advisable as they’re least likely to target a group versus one person. You should withdraw cash from ATMs during the daytime instead of at night and preferably indoors at a mall or bank. Don’t hail taxis in the street; ask a staff member at your hotel to call one whenever you need a ride. If you ever fall victim to a kidnapping, it is best to cooperate and give up your money to the assailants, without a fight. Many people associate drugs cartels and violent criminal gangs with Latin America, and are afraid to travel to many territories. There are certain hotspots that should be avoided, but overall the region is the same as any major city or popular tourist destination. You will need to take precautions against thieves, opportunists, and scam artists. The more dangerous areas in Latin America include Venezuela (especially Caracas and anywhere near the Colombian border), certain parts of Colombia, the northern border area of Ecuador (particularly in the Oriente), and some remote and even frequently visited archaeological sites, (mainly in Peru). 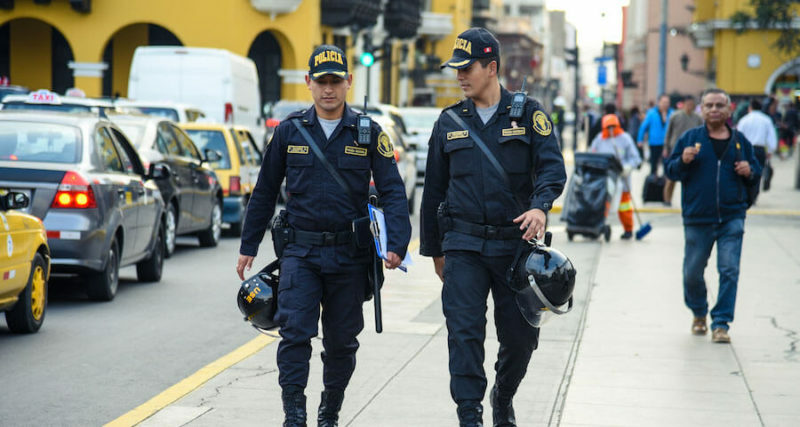 La Paz, Bolivia; Caracas, Venezuela; Rio de Janeiro and São Paulo, Brazil; and Quito, Ecuador, are all well known for assaults on tourists. Stay alert and be careful of people that approach you under the guise of any type of assistance, whether driving or on foot, as this may be a setup to rob you. Marijuana and cocaine are big business in parts of Latin America, so stay away from all activities and situations where you could possibly become involved in anything criminal. Always carry identification and be wary of police officers, as some are corrupt and may try to bribe you for minor infractions. Don’t accept food or drink from anyone, and watch your drink while in bars. You could be drugged, then robbed or raped. Don’t flag a taxi or get in one that already has a passenger. Have your hotel call one or travel in a group. There have been incidents of what’s called “express kidnapping,” where a passenger is held captive and forced to empty their bank account(s). Keep your valuables concealed, including cell phones and cameras. Don’t travel with too much cash and keep your cash and credit cards in different places. Backpackers should keep a small padlock on backpacks and keep bags on their laps while traveling. Make sure to check facilities and equipment are in good working order, and guides are competent when engaging in adventurous and rugged activities.